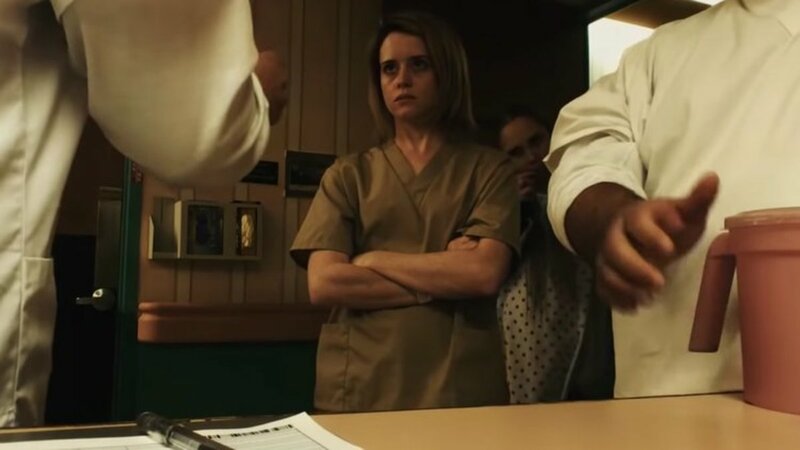 Unsane is unlike any movie I’ve ever seen. Legendary director Steven Soderbergh has decided to abandon typical Hollywood filmmaking styles with this movie. Instead, he shot it all on an iPhone 7 with harsh natural lighting, and bizarre angles you can only accomplish by throwing your phone across a room. Now, I’ve seen weird iPhone projects before, just never on this scale. This is a big, studio-backed, wide-released feature length film. Its leads are The Crown’s Clair Foy and SNL’s Jay Pharaoh, two big stars in their own right, and it’s shot by the man who once beat himself for the Oscar for best director. This high profile nature is part of what makes Unsane so bizarre, and ultimately rather off-putting. 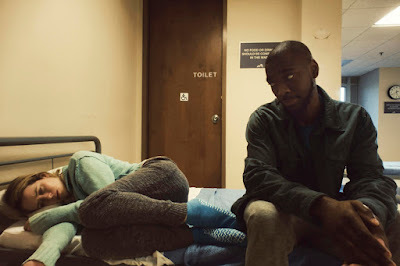 Foy stars as a young woman who accidentally commits herself to a shady mental health facility after attempting to seek help for PTSD symptoms she’s faced following a stalking incident in her hometown. Once there, she begins experiencing firsthand how the hospital mistreats their patients and staff, and she learns that they’re more interested in collecting insurance money than in helping people. A few spooky asylum movie tropes later, Foy now finds herself face to face with her stalker once more, only this time in the form of one of her doctors, and Hamlet-style game of “is she crazy or is she telling the truth” ensues. At the same time, the movie pushes on through with more bonkers imagery and mental-patients-are-scary story beats we’ve seen in countless schlocky exploitation movies before. 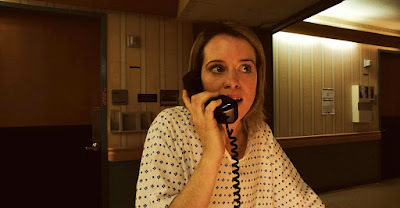 The thing is, though, Unsane doesn’t think it’s an exploitation film most of the time. Being a modern thriller about abuse and mental health, it has to walk the typical egg shell tightrope of “is this in poor taste” that all these types of movies have to tread. In the case of Unsane, it’s kinda hard to tell if they stick the landing. The tone shifts wildly back and forth between handling the subject matter with care and treating it like a campy grindhouse-style B-horror movie. It’s ultimately hard to pin down exactly what it is this movie’s trying to say about mental health, if anything. It honestly might just be using it to be a spooky setting, which is fine if that’s the tone it’s going for. It just needs to decide. There’s a difference between an exploitation genre movie and one that’s just exploitative. The camera work is straight-up nuts, which I mostly appreciated. This is an experimental film, and so it experiments with how a scene can be shot and edited. Sometimes that lands, sometimes it doesn’t. But that’s okay. For Soderbergh, it seems to be less about results and more about figuring out how far we’ll let him go. A typical not-shot-on-a-phone movie might cover a scene with two close ups and perhaps a wide shot for perspective. Maybe some flashier camera moves as well if it’s a particularly stylized project. In Unsane, scenes are covered with a shot/reverse shot, wide shot, wide shot from the other side of the room, and a semi-obscured close up shot where the phone is just sitting on the table between the actors, all of which are cut to rapidly and seemingly at random. It’s almost dizzying and at times hypnotic, like the cameras were being directed by squirrels. Considering that this is a film about insanity and stalking, it seems right that it feels like the camera has been hidden in places it doesn’t belong. Sometimes it feeds into the style nicely. Again, this movie is, more than anything, an interesting experiment. The performances are fine. Foy swings wildly for the fences, which sometimes works for her character and other times aggressively doesn’t. Her American accent is also distractingly off. Jay Pharaoh, on the other hand, is charismatic as hell and absolutely shines with every second he’s on the screen. It’s honestly baffling to me that this movie is getting a wide release. I can’t imagine general audiences enjoying this at all, let alone being able to even watch it, considering how strange it looks. This is in every way and experiment and should be treated as one. There are a few conventionally thrilling moments, and the campier spooky hospital segments were fun, but ultimately the biggest takeaway for me was how it looked. And it looked nuts.